Small Business Internal Audit 1.7 is accounting & finance software developed by South Beach Software. Small Business Internal Audit is an all-in-one software program that provides you with the tools needed perform your own internal audit. The program uses a simple step-by-step process so that you can easily perform a small business internal audit. After you have audited your business, Small Business Internal Audit provides you with targeted revenue growth, cost cutting and customer service strategies. This business software is shareware, which means you can download and use Small Business Internal Audit 1.7 for free during the trial period (usually for 30 days). At the expiration of the period you will have to buy the accounting & finance product for $149.95. 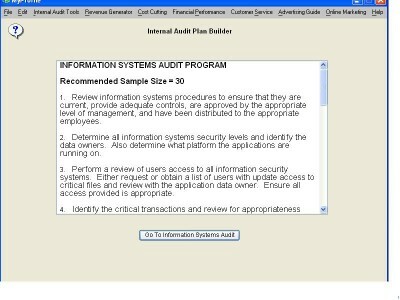 Small Business Internal Audit 1.7 is available at regnow and South Beach Software website. Small Business Internal Audit 1.7 supports English interface languages and works with Windows 98/XP/Vista. We have tested Small Business Internal Audit 1.7 for spyware and adware modules. The software is absolutely safe to install. We has completely tested accounting & finance software Small Business Internal Audit 1.7 many times, written and published the interesting article and uploaded installation file (5560K) to our fast server. Downloading Small Business Internal Audit 1.7 will take minute if you use fast ADSL connection.